A warm night, blankets on the grass and looking up at a dazzling firework display can be very enjoyable for us ... but not for our dogs. The sounds, smells and lights can overwhelm even the calmest of dogs. Follow a few easy steps to help your dog handle fireworks and thunderstorms. Exercise - When you know there will be fireworks, or even a thunderstorm, plan accordingly. The day of the event take your dog on a long and rigorous exercise jaunt. This will vary with every dog, their energy level and age. However, whatever is appropriate for your dog, get them tired! They'll be more likely to want to rest when all the activity starts. Secure the Doors - When a dog is startled, they can easily wiggle through the smallest of openings. Secure any doors and windows in your home. Stay Indoors - Speaking of your home, keep your dog inside during the time of fireworks. If at all possible, stay with your dog, too. Comfort - Make a cozy place for your dog to retreat to. Fill her crate or other place of comfort with favorite toys and blankets. Specialty Products - You may want to consider some specialty products if the above tactics aren't enough. An item that is often successful in relieving stress in dogs is a snugly fit Anti Anxiety Jacket or Coat . Another route to go is with calming essential oils. You can find Dog Safe Drops, Sprays and Diffusers that contain a blend of essential oils proven to help calm dogs. Your dog relies on you to help her feel calm and safe, so please consider applying one or all of the above suggestions if you have a stressed canine. Our Chicken Broth Dog Biscuit Recipe is a perfect fit for a stressed out dog. The first reason is that the ingredients are very mild. The last thing you want is an upset tummy when your dog is nervous. The second reason is that the dog biscuit is a wonderful vessel for calming drops like Rescue Remedy for Dogs . 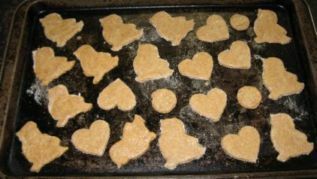 Or, if you don't have the time to make a homemade calming dog treat, you can purchase a commercially made package of calming dog treats . "I baked these cookies for my little dog today, they were very easy!" "My Micki girl loves them. I keep them in the freezer to give her a cold treat. Thanks for coming up with this idea." "My mini schnauzer loved this recipe. I swear she waits in the kitchen while they're baking. 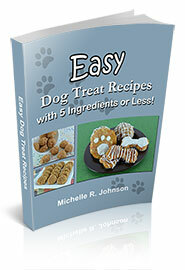 The recipe is very easy to follow and easy to double or triple to make extra for other doggie friends." "Thanks so much. You have given me a little more information. I have been working on this for a very long time. I didn't think there was anywhere else to go for information. Your website is really wonderful. Thanks again. "